We’ve probably already mentioned that we’re on a tasty journey through the varied flavors of the Asian continent – because, well, it’s all we can talk about! And in the last couple weeks, we’ve really dug into Thai cuisine. There’s just something about the combination of spicy Thai peppers and cooling herbs that tastes so perfect on the almost tropical evenings we’ve been enduring this summer. Our recent efforts have been ever-more rewarding, as we now have a Thai expert at our disposal — our brother, Will. Will is a natural builder and spent six months living in Thailand… but this summer he’s become our official taste-tester. When he says our kitchen smells like a Thai food market, we know we’ve hit a recipe on its head. This month we wanted to tackle a dish that we tasted at Andy Ricker’s famous Pok Pok Thai restaurant in NYC. 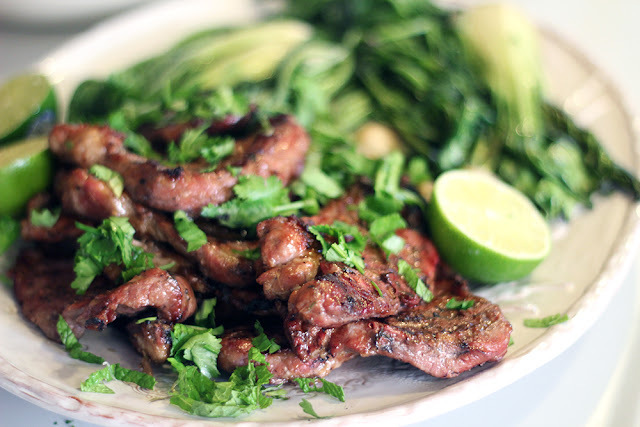 It’s a simple but authentic dish of thinly-sliced grilled pork shoulder, marinated in a paste of cilantro roots, garlic and soy sauce, served with greens and rice. 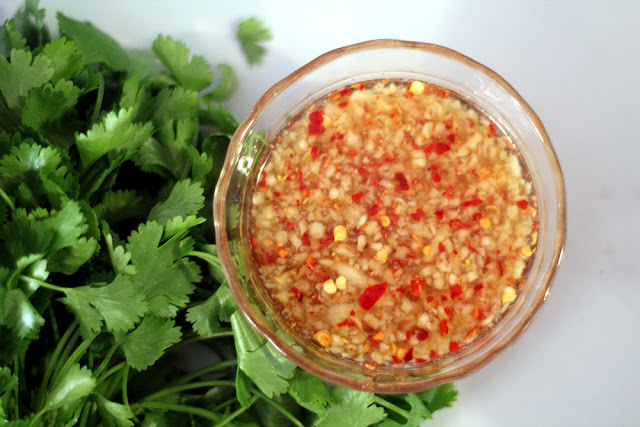 It is a perfect summer dish, and except for some fish sauce, it calls for no unusual ingredients. 1. 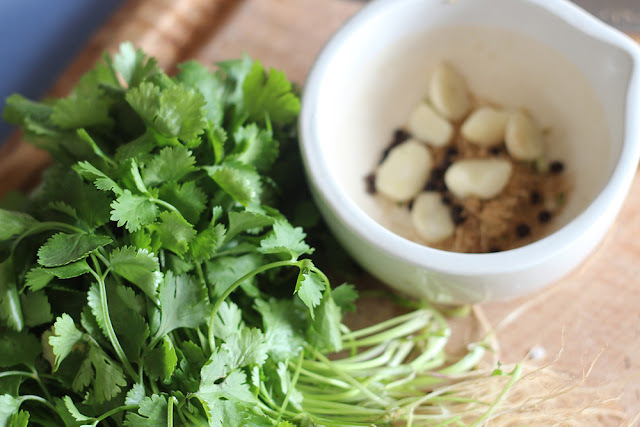 Pound garlic, cilantro roots and peppercorns together in a mortar and pestle or mix ingredients in a food processor. Either way, you’re going for a paste. 2. Cut shoulder meat into 1/2-inch thick slices. Rub paste onto the meat and marinate for an hour. 3. Grill the meat over a medium heat for 4 minutes on each side. 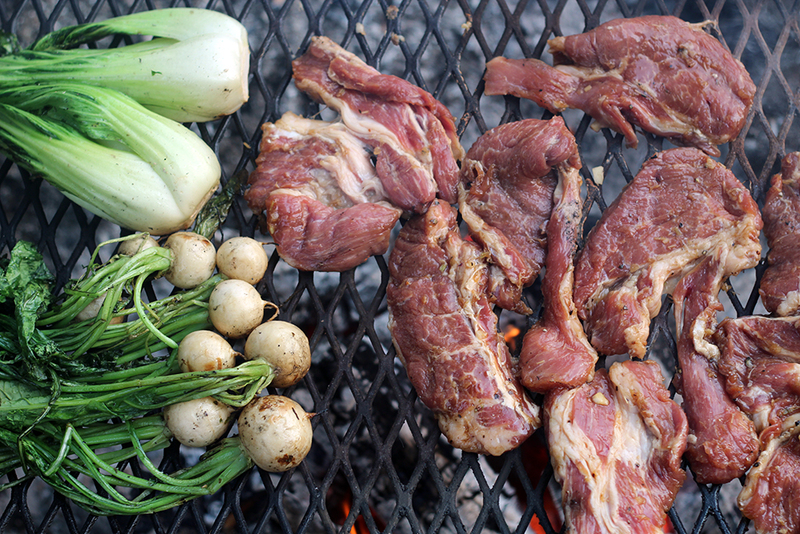 Mix all together in bowl and serve along side grilled meat. Serve meat and sauce with bibb lettuce leaves or bok choy leaves and rice. Note: This recipe originally appeared on RuralIntelligence.com on July 13, 2015. It's been back-dated here on our blog so that it falls, seasonally, in the right place.